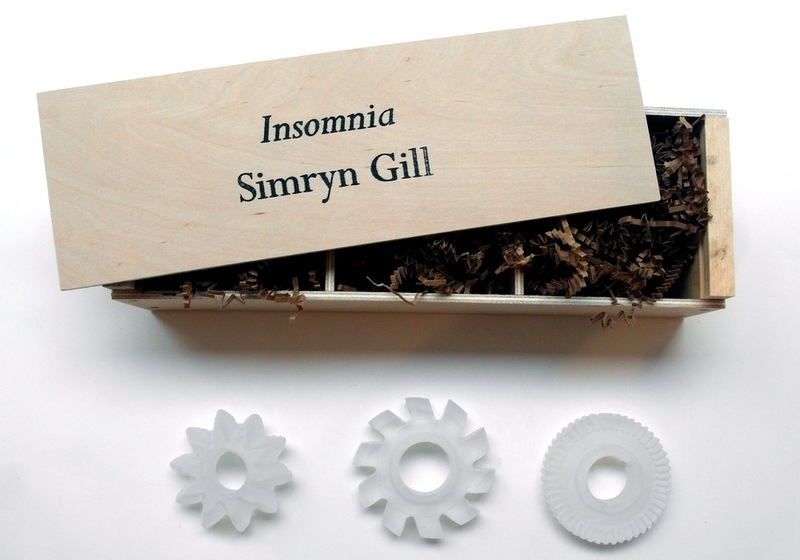 Insomnia is the first small-scale sculpture edition by Simryn Gill, who works between Sydney, Australia and Port Dickson, Malaysia. Opaque leaded glass replicates three metal gears originally used in the machinery of Tata trucks, often produced in India and used in Malaysia for shipping and transport. Insomnia directly relates to Gill’s work Throwback, shown at documenta 12 in 2007 and also recalls Naught, at the Australian Pavilion at the 55th Venice Biennale. The three glass gears come packed in a stamped wooden crate with shredded Kraft paper. Simryn Gill (b. 1959, Singapore) draws from her diverse surroundings to create conceptual installations that explore how memory and history affect culture and the landscape. In past works, Gill has assembled casually collected objects and invited the viewer to play with and rearrange them. Recent projects include the Australian Pavilion at the 2013 Venice Biennale.